Christmas Citadel is a furni range that was released on 25th November 2016 into the Builders Club Catalogue as part of the Christmas campaign and it was then released into the regular Catalogue on December 1st. Throughout December, there was an Advent Calendar door to be opened and provided each Habbo with a small Christmas gift. Furniture could also be obtained via games. Every day a new game was available to play, and each came with a Badge and a prize to be won. As part of the campaign, new furniture and Christmas clothing were released, several competitions were held, and new Room Bundles and Rares were released and sold. As part of the campaign, all Habbos were given a free pair of Artisan Antlers. However, new clothing items were also released on December 5th and could be bought throughout the campaign with both Credits and Duckets. Four Room Bundles were released throughout the campaign, each containing an exclusive furniture item that can only be obtained via the Bundle. After the new furni range was released into the Builders Club catalogue, a Room Competition was held asking users to build a room to express their Christmas fantasies. First place winner won themselves seven days of Builders Club, two days of Habbo Club and a Badge. Nine runners up won themselves two days of Builders Club and a Badge. Two creative competitions were released on social media for the campaign; a room building and a drawing competition. The room building competition asked the entrants to build a room to show a scene from one of their favourite Christmas movies. The overall winner won an exclusive Badge that only 15 Habbos worldwide owned, Santa's Office Bundle and a Crystal Tiara. 2nd-5th place runner ups won themselves one of the 15 exclusive Badges and a Crystal Tiara. 6th-15th place runner ups won themselves one of the 15 exclusive Badges and seven days of Habbo Club membership. The second competition was asked to pick a Habbo character, for example Frank or Bonnie Blonde, and draw them in a Christmas outfit. The overall winner won an exclusive Badge that only 15 Habbos worldwide owned, Common Room Bundle and a Rufus Cat Hat. 2nd-5th place runner ups won themselves one of the 15 exclusive Badges and a Rufus Cat Hat. 6th-15th place runner ups won themselves one of the 15 exclusive Badges and seven days of Habbo Club membership. 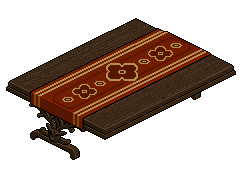 These are the winners for the room building competition following the 'Twitter Name (Habbo Name)' format. These are the winners for the drawing competition following the 'Instagram Name (Habbo Name)' format. This page was last edited on 2 July 2018, at 03:23.